Professor Annette Herscovics, PhD FRSC, of the Department of Biochemistry and the McGill Cancer Centre died on Sept. 6 with her family at her bedside after a long battle with cancer. An internationally renowned pioneer in the field of glycobiology, Professor Herscovics showed that sugars (glycans) have a profound effect on the behaviour of cells in genetic diseases and cancers. She remained fully involved in her research and teaching until her death. The daughter of Polish immigrants to France, Gersz Nejman (d. Auschwitz 1942) and Ruchla (née Lewi), Professor Herscovics was born in Paris in 1938 and was a hidden child survivor of the Holocaust under the Vichy Regime in southern France. Having had little time to learn English after immigrating to Canada, she came third (top female) in the Quebec provincial high school matriculation exam. 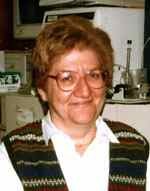 She was awarded a scholarship which enabled her to complete her undergraduate studies and subsequently obtained her PhD in biochemistry from McGill in 1963. She completed her post-doctoral work in the Department of Anatomy, then moved to Harvard Medical School in 1971, returning to McGill in 1981; she became a full professor in 1987. Having overcome many hurdles prevalent to her generation as a woman in science, she is remembered by many as a role model, mentor and advocate of equality for all. In recognition of her contributions to science, and in particular the field of glycobiology, she was elected in 1998 as a Fellow of the Royal Society of Canada, the nation’s most prestigious scholarly organization. “We all know Annette for her indomitable human spirit and courage, and also of course as a colleague who made enormous contributions to the science of glycobiology,” wrote Professor David Thomas, Chair of the Department of Biochemistry, in a note informing members of the department of her death. During her more than 25 years of work in the McGill Cancer Centre, Dr. Herscovics “was a key scientist and a mentor for several generations of cancer researchers,” said Professor Michel L. Tremblay, Director McGill Cancer Centre. The Cancer Centre and Biochemistry Department plan to hold a scientific event in coming weeks to honor Annette Herscovics’s work and her many contributions to McGill. For information, contact Sarita Benchimol at the Cancer Centre; tel. 514-398-3535; email sarita.benchimol @mcgill.ca or Marlene Gilhooly Biochemistry Department, tel: 514-398-7263, email: marlene.gilhooly@mcgill.ca.